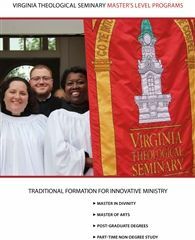 Pathway to Ministry is a new academic program from Virginia Theological Seminary offering one tuition-free year of study to students who have not yet engaged a discernment process but wish to pursue formal theological education in an academically rigorous and spiritually nurturing environment. During this year at VTS, students will: enroll in a selection of courses that provides a well rounded foundation of theological knowledge; participate in a structured program of discernment; are eligible to receive the Diploma in Theology at the end of one year, with the option to continue for a second year (earning a Master of Arts degree), or stay for a third year (earning the Master in Divinity). During their tenure at VTS, Pathway to Ministry students have the option of engaging a diocesan ordination process. If, through this work, a student and diocese determine a call to ordained ministry, the student can move through the rest of the ordination process and complete the Master in Divinity degree in three years. If a student and diocese conclude that ministry will be as a lay person, the student may then choose how best to move forward with formation (i.e., M.Div., M.A., or Diploma). Any of these three degree/ diploma options is open to any student in the program regardless of canonical status. Pathway to Ministry is tuition-free for the first year and includes an additional $5,000 stipend. If a student wishes to continue for a second or third year, he/she may apply for VTS financial aid following the standard guidelines for all other Master’s level programs. The program is limited to a maximum of eight students per year. Applications will be considered on a rolling basis; however, discerns are asked to apply no later than April 1. For more information or to apply, please contact the Office of Admissions and Financial Aid at admissions@vts.edu.